Toho submitted the film to the US copyright office on December 21st, 2001 with the registration number PA0001195981. 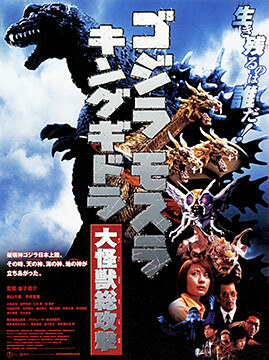 The movie was submitted with a variant of its Romaji title in the form of Godzilla Mothra King Ghidorah: Daikaiju Sokogeki, which uses the English names of the monsters. There are two additional names on the application. One is the movie's international title, Godzilla, Mothra and King Ghidorah: Giant Monsters All-Out Attack. The other is Godzilla vs. the Guardians, which was possibly considered as either an international or the US title at one stage. Special effects director Shinji Higuchi helped with the production's special effects story boarding process. However, unlike past movies from Shusuke Kaneko in the kaiju genre, he was not involved in the directing of the special effects sequences. Noted by Norman England. In an earlier draft, titled Godzilla X Varan, Baragon and Anguirus: Giant Monsters All-Out Attack, the trio of guardian monsters included Varan, Baragon and Anguirus. However, both Varan and Anguirus were substituted for Mothra and King Ghidorah for the final version.